The amount of electricity generated by nuclear power plants worldwide fell by just over 4% in 2011, primarily due to reactors being idled in Japan following the Fukushima accident and Germany's reflex reaction to close its older units. Total nuclear electricity generation in 2011 was 2518 TWh, 4.3% less than the 2630 TWh generated in 2010, according to figures from the International Atomic Energy Agency (IAEA). Generation had increased in 2010 following three consecutive years of decline. Thirteen Japanese reactors were shut down as a direct result of the 11 March earthquake and tsunami. Units 1 to 4 at Fukushima Daiichi have been irreparably damaged and, together with the undamaged units 5 and 6, are to be decommissioned. Units 4 and 5 at the Hamaoka plant have been shut down at the government's request and are unlikely to restart for at least several months, while nine reactors - units 1 and 3 of the Onagawa plant, unit 2 of the Tokai plant, all four units at the Fukushima Daini plant - are in cold shutdown and it is not yet known when these will be allowed to resume operation. By the end of 2011, 31 of Japan's 54 reactors had also been taken offline for inspections or equipment replacement, and are still awaiting approval to restart. The full impact of Japan's suspension of its nuclear fleet will be felt in 2012 and is likely to continue until reactors are restarted. Only six reactors were still in operation at the end of 2011, but five of these have since also been taken out of service and the final one is expected to be taken offline by early May. As a result of the instant loss of capacity and the gradual shut downs, Japan's nuclear electricity generation fell by 44.3% in 2011 to 152.6 TWh, compared with 280.3 TWh in 2010. The accident resulted in Germany imposing a three-month moratorium on the operation of its oldest reactors. This was followed by a decision to permanently shut down the seven units that began operating in or before 1980, plus one reactor that has been in long-term shutdown. As a result, Biblis A and B, Neckarwestheim 1, Brunsbüttel, Isar 1, Unterweser, Phillipsburg 1 and Krümmel were closed, wiping 8336 MWe from Germany's generation capacity. These shutdowns helped contribute to a 23.1% decrease in the country's nuclear electricity generation, from 133.0 TWh in 2010 to 102.3 TWh in 2011. The weighted average energy availability factor of the world's plants operating in 2011 was 78.7%, down from 81.0% in 2010, according to the IAEA. Apart from the Japanese and German units, just one other reactor was shut down in 2011. The UK's Oldbury 2 Magnox unit shut down in June 2011 after 43 years of commercial operation. Meanwhile, six new nuclear power reactors were connected to the world's electricity grids in 2011: two units in China (Lingao II unit 2 and Qinshan II unit 4), plus Kaiga 4 in India, Bushehr in Iran and Kalinin 4 in Russia. Together, the new units added 4014 MWe of capacity. Additionally, the Chinese Experimental Fast Reactor (CEFR) was also connected to the grid for the first time in July, and was expected to ramp up to its full 20 MWe power before the end of 2011. 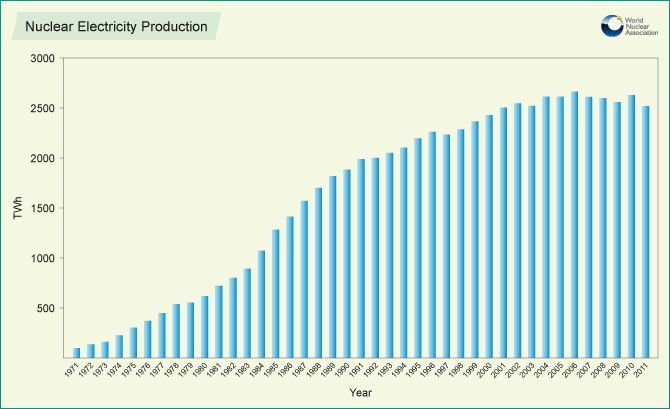 Capacity uprates at plants in the Czech Republic, Finland, Mexico, Spain and the USA added in excess of 440 MWe to the world's total nuclear generation capacity, and by 31 December the world had recorded 14,713 reactor-years of nuclear power generation. Only two reactors formally began construction in 2011: Pakistan's Chashma 3, a 340 MWe (gross) pressurized water reactor in May, and India's Rajasthan 7, a 700 MWe (gross) pressurized heavy water reactor in July. Construction had been scheduled to begin on at least three new Chinese units during the year, but the country, which has more than 25 reactors currently under construction, temporarily suspended issuing approvals for the start of construction of new nuclear plants after the Fukushima accident.